Buy Qwirkle and PriceWatch, Buy this board game at the Lowest Price. Qwirkle is very easy to set up and get into. It consists of a bunch of wooden blocks and a small sack. On the blocks there are 6 different shapes, of 6 different colors, and then there are 3 of each block. You put the blocks into the sack and mix it up and each player takes 6 blocks each and you begin. The idea is to place your blocks on the table in lines according to shapes or colors. If you have 3 circles, you can put them down. If you have 4 blocks that are all the same color, you can put those down. The only catch is that they have to fit accordingly to what has already been played. Just like in Scrabble, in which you can only play tiles off of words in a way that makes other words, in Qwirkle you must play your blocks in such a way as to maintain the same color or shape throughout each line. After your tiles are played you get awarded points; one point for each block of each line you've added. So if you play a 3 block line you get 3 points. If you played that perpendicular off the end of a 2-block line creating another 3-block line, you would get another 3 points. If you are able to complete or play a full line of 6 blocks, called "a Qwirkle", you get a bonus 6 points. The game ends when the sack is empty and a player uses the last of their tiles, for which they get a bonus of 6 more points, and the player with the most points wins. The beauty of Qwirkle lies in its simplicity. I hate to use the cliché, "it takes minutes to learn, but a lifetime to master", but it's definitely true in this case. You can have just as much fun playing this with a group of adults as you could playing it with kids. The more you play, the more you start to wrap your head around some strategies that you can use to maximize your points and minimize those of your opponent. For kids, they learn their colors and shapes, and start to develop some analytical thinking skills, but all in the name of fun. 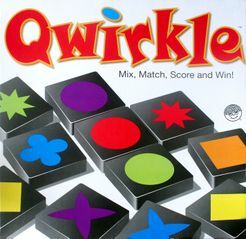 There are only two slight issues I have with Qwirkle, and one of them is more due to a personal shortcoming than anything. That issue would be that this game is not entirely friendly if you are color-blind. Fortunately, my color-blindness is not severe and I was still able to sort everything out. However, if you are playing in a low-light environment it does get a little problematic. The only other concern is the space needed to play. The blocks are a decent size, so as the game progresses it starts to take up a fairly large area and because of this you will need to make sure you are playing at a fair sized table. If neither of these are issues, and you have some paper and a pencil to keep score, then you should be able to play without any problems. All in all, Qwirkle is a great game. The approximately $20 price tag is very fair since it's very well constructed and durable. You don't have to worry about spilled drinks wrecking pieces or ruining the whole game altogether. It's easy mechanics and rules make it something that you can play at any time and doesn't really require any extra brain power, but isn't insultingly simple. It's definitely fun for the whole family, young or old, and as we found out at the cottage that weekend, drunk or sober.